The Sun or Surya is the soul of all that moves or doesn't move. If the Sun is well placed in your horoscope, then lighting Arka incense cones will inspire leadership qualities, power and confidence in you. Sun or Surya is the soul of all that moves or doesn’t move. If the Sun is placed well in your horoscope, then lighting Arka incense cones will inspire leadership qualities, power and confidence in you. However, if the Sun is ill placed, you might have to suffer the negative results. 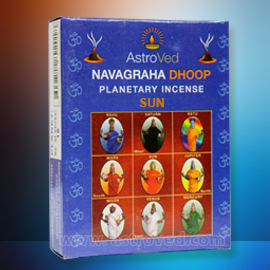 Lighting Arka incense cones nullifies the ill effects of the Sun in your horoscope to a great extent. In Sanskrit, Arka means ray of light and in the ancient scripts of Ayurveda, Arka is mentioned as a healing herb. Arka leaf is offered to Lord Ganesha during Patra Pooja. This plant grows to the height of 3-5 meters is found in India and grows in dry wasteland. It is believed that Pooja to Lord Hanuman remains incomplete without the offering of a garland made with Arka flowers or Arka leaves. Note: You will receive 6 packs (or boxes) of incense. Each box will contain 18 incense cones made of Arka and a metal plate on which you can light and place the incense cone.